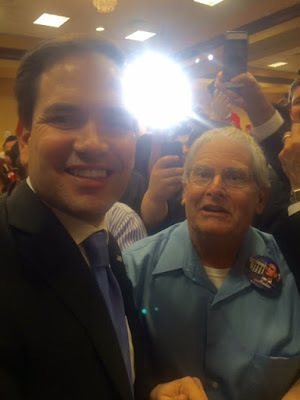 What an honor it was for me to meet Senator Marco Rubio after his pre-debate rally in Houston, Texas on Wednesday Feb. 24, where the CNN/Salem/Telemundo debate will be held Thursday Feb. 25, 2016. I can honestly say Marco Rubio's speech was the greatest political speech I have ever heard in my lifetime. What a great communicator. As I have said previously, and I'm convinced more than ever after hearing him in person, Marco Rubio is the greatest communicator of conservatism since Ronald Reagan. Marco gave over a one hour speech with no notes, no teleprompter an inspirational stirring speech of the greatness of conservatism and the importance of someone who can bring the Republican Party and the nation together for a new great American century so that we can continue the tradition of leaving to our children and grandchildren a better future, as our parents did for us and our grand parents did for our parents. Marco Rubio said his first action that he will take when walking into the oval office for the first time, after doing away with the illegal executive actions of Obama, would be to make a call to the Prime Minister of Israel to tell him he was tearing up Obama's nuclear deal with Iran. He got many huge ovations throughout his speech and there were smiles all around. This was Marco Rubio country, baby! When shaking his hand I told Senator Rubio, as a Jew I really appreciated his strong unwavering support for Israel. He told me with that great smile he has, "absolutely". I am praying the GOP doesn't waste this opportunity to nominate someone with so much talent and appeal to the general public as Marco Rubio. Not just for the Party's sake, but for the future of this country. You know me, I like Cruz policies. But I'd take Marco Rubio in a heartbeat if he's the nominee. Very easily. Congratulations on your meeting. Very nice indeed.